Virgile Lignier has worked alongside his father since 1988, really taking charge from 2000 by which time all the wines were being bottled at the domaine. Significant advances were made in the vineyards, reducing yields and ploughing the soil, along with the introduction of a sorting table and a higher percentage of new wood in the cellar. Virgile’s expertise was tested here, as these lower- lying vineyards (Les Seuvrées and Les Murots) were attacked aggressively by mildew. 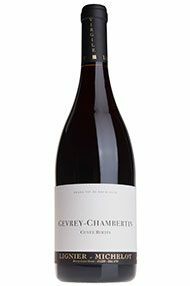 He has, however, emerged with honour, as this is good, honest Gevrey, built in a lighter but appealing frame. Drink 2020-2026. 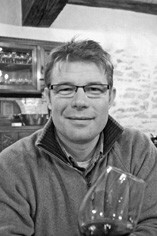 Virgile Lignier started working alongside his father in 1988, really taking charge from 2000, by which time all the wines were being bottled at the domaine. Significant advances were made in the vineyards, reducing yields and ploughing the soil, along with the introduction of a sorting table and a higher percentage of new wood in the cellar. The domaine has an exemplary range of Morey- St Denis vineyards, supplemented by one or two cuvées from neighbouring villages. By his own admission, in his early days Virgile Lignier looked for too much extraction from his wines. The tide began to turn in 2006 and today he is very comfortable in his style. He does like to look for good levels of maturity and he waited just a day or two more than his neighbours to pick, beginning on 29th September and finishing on 3rd October in his Faconnières vineyard. He likes long skin contact, starting at a cool temperature, but with limited pumping over. Virgile is perfectly satisfied with his results in 2016, but did remark that it was hard work getting to what was eventually a very healthy harvest. When Virgile Lignier came back from his brief summer holidays, he toured the vines and saw a bit of rot on a biggish (by recent standards) crop, so he took a substantial team round to remove damaged bunches and anything unripe. He picked the healthy grapes from 17th September and gave the new vintage a long but light extraction. He has made some very succulent, juicy wines here in 2014. From Les Drazey (65 years old) and Les Gamaires (52 years old) vineyards, blended during vinification. Dense, vibrant dark black fruit, with good acidity behind, making up a compelling cuvee, lightly dusted with 30% new wood. Because these are very old vines on clay, this had 80 percent whole-bunch. Glowing purple, it has the most beautiful, lifted nose. It’s a joy on the palate, with a beautiful expression of red-purple fruit. This is beautifully poised, with the perfect thread of mineral acidity, long and fine. Drink 2022-2030. Virgile Lignier began picking on 9th September, bringing in normal yields if a bit below 2014. Virgile reports small berries, an entirely healthy crop, potentially as good as 2005 but with a better quality of tannins. He worked on very careful extraction to manage them, using a bit more whole-cluster (especially with old vines on clay rich soil), longer cuvaison, but no punching down except at the very end of fermentation. He uses 30 percent new wood throughout the cellar. This is a blend of three lieux-dits: Bons Bâtons, Champs Perdrix and Les Hâtes. Production is down about 20 percent, but the lovely quality fruit permitted 50 percent whole-bunch and 30 percent new oak, almost like a village wine. 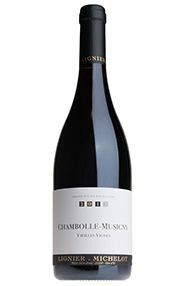 With charming cherry and red fruit, it has a neat, compact finish. Well made. Drink 2019-2024. A fascinating contrast to Castagnier’s version, Virgile’s use of 70 percent whole-bunch makes this plumper and more succulent. The minerality of the vineyard is more cushioned, and the svelte-style Morey is more in evidence. Drink 2022-2028. This sits just underneath Clos de la Roche and bears more than a passing resemblance to its neighbour. The 70-year-old vines produce tiny berries, giving great concentration of luscious blue fruit, plenty of power and a rocky, stony finish. A mini Clos de la Roche. Drink 2023-2030. Having tasted numerous different wine styles Virgile decided he loves wines made with whole bunches, and has set about changing his winemaking to include a larger proportion each year, arriving now at a stage where he can’t imagine himself using less than 50 percent. His winemaking is consequently very gentle to avoid extracting harsh tannins from the stems. He began harvesting on 10th September, a little later than some neighbours as he waited for the stems to ripen. Virgile feels this is a vintage which has gained enormously from élevage, giving fine, elegant wines which will drink well early and age surprisingly well. This is a blend of three lieux-dits in ChambolleMusigny: Bon Bâtons, Champs Perdrix and Les Hâtes. With 70 percent whole bunches, the floral character of Chambolle is emphasised and amplified to give a wine of real charm. Crunchy fruit and delicate tannins combine to give a wine of almost village quality. Drink 2019-2023. Situated next to Mazoyères, this has some of the explosive floral character of its neighbour, alongside intense fruit. The palate is rich and charming with layered tannin and balancing acidity. There’s a floral perfume to the finish that comes and goes. Excellent. Drink 2021-2026. A blend of three different parcels, the vines are all at least 65 years old. With 80 percent whole-bunch and 30 percent new oak, this is quintessentially Chambolle, with a deeply perfumed and pepper-spice nose. On the palate, rich blueberry fruit is wrapped in chalky tannins which give a serious and intense structure at the back. Drink 2020-2024. This is just below Charmes, but has a completely different soil type and expression. Here the soil is rich in limestone, which gives a more nervy and mineral style. Virgile used 100 percent whole-bunch, creating an intensely floral nose with notes of peony and rose petals. The palate has plump fruit, which fills out the middle before the rocky, chalky tannins cut through and leave a refined, pure finish. Drink 2022-2027. Named after Virgile’s son, Bertin, this is a blend of Seuvrées, Creux Brouillard and Murots. The whole bunches (100 percent) add some floral notes to the slightly meaty, spicy, dark-fruited nose. The palate has wonderful purity of red cherry, with some violets before cleansing acidity rounds out the whole. Drink 2020-2025. This lieu-dit just above Clos de Tart has a very cool, mineral terroir. This saw 80 percent whole-bunch and 30 percent new oak. The nose is pretty, with a delicate lift and an energy which flows through to the palate. Pleasant, medium-weight fruit is underpinned by a cool, chalky grip from the limestone soil. Drink 2020-2024.